If you’re lucky enough to be the kind of person who can pretty much roll out of bed and into the car in less than thirty minutes, a heavy blunt cut fringe is probably not for you. It requires proper styling, setting and regular check ins throughout the day. Centre, side, or blunt cut straight across. A fringe is going to frame your face, so it’s imperative that you know you face shape and which style is going to work for you. Generally speaking: Heart shaped faces are complimented by a centre part while square and circle shapes, work better with a side part. An oval shaped face is the most manageable of them all, working well with relatively all styles and a blunt cut fringe can typically be adapted with layering and length to work with most shapes. Pay attention to what your hair is telling you. Choosing a fringe that works for you is really more about taking into consideration the texture natural wave of your hair. Curly hair generally doesn’t work when cut above the eyes and super wavy hair requires a long side swept fringe. Loose and long fringes are a great way to test the waters. Centre part them to frame your face with layers, sweep them to side adding instant volume or style them back into a cute low ponytail or braid. 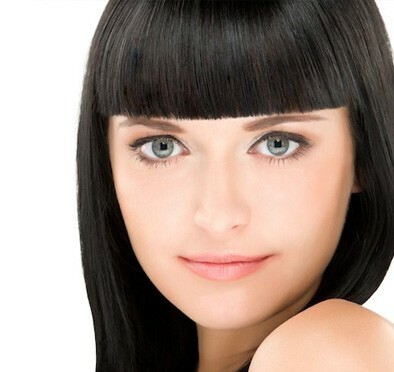 Hair extensions are a great way to create a look that your natural hair may not be able to accommodate for. Want a super blunt full fringe, or boho bangs that part perfectly in the centre, but can’t rely on your unruly hair to give you the right look? Add a full head of keratin bond extensions for instant length, volume and just the right texture.